Instagram-worthy and bae-friendly, Bison Country Homestay is where you need to check in to enjoy the best of Coonoor — the wilderness, the salubrious climate, and the majestic views. Plus the drive down to this place is picture-perfect. Bison Country Homestay gets it name from the majestic bisons that often graze the slopes of the mountains as well as the forests. Before you enter the property, stop and look around — the whole place is surrounded by tea gardens and it looks picture postcard perfect. One thing guaranteed during your stay is that you’ll never run out of greens to lay your eyes on. Furthermore, even on your way to this homestay, depending on the route you take, you will either pass Sim’s Park or the famous Beulah Farm. Road trip goals unlocked in one single trip, we say. The property consists of two independent cottages complete with private lawns, two suites, and a common gazebo. The rooms offer an excellent view of the surrounding hill and valleys, so waking up in the morning can be such a treat. The cottages and rooms are spacious and come with all the modern amenities as well as all-day hot water supply. There’s no room service as such, as the homestay works on a self-help model. You’re free to make use of all the amenities available. The salubrious climate along with the scenic surrounds makes the surrounding regions excellent for trekking. Get your binoculars and DSLRs to this place as there are plenty of opportunities for you to sight animals such as bisons, deer, wild boars, and if you are really lucky panthers. Also, the whole place is teeming with birds of all kind, with the jungle fowl, common to this part, flocking about everywhere. Apart from this, you can spend your evenings by the gazebo and enjoy the bon fire. 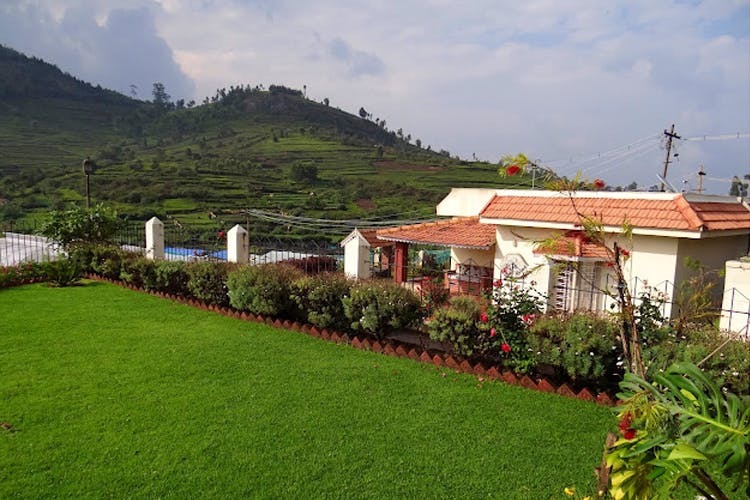 You can even visit touristy spots such as Sim’s Park, Lamb’s Rock, Dolphin’s Nose, or even drive down to Kotagiri that’s roughly 20 kilometres from Coonoor.